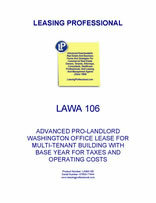 This form is for a single tenant Washington lease where the tenant has superior leverage. It gives the tenant the right to use the premises for "any legal use," and has very abbreviated remedies for the landlord in the event of a tenant default. 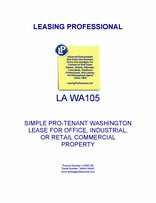 It is also pro-tenant in character because of the clauses it does not contain which customarily appear in pro-landlord forms relating to remedies and a variety of other pro-landlord provisions. Significant industries within Washington include the design and manufacture of jet aircraft (Boeing), computer software development (Microsoft, Amazon.com, Nintendo of America), electronics, biotechnology, aluminum production, lumber and wood products (Weyerhaeuser), mining, and tourism. Washington has significant amounts of hydroelectric power generation. Significant amounts of trade with Asia pass through the ports of the Puget Sound. Fortune magazine survey of the top 20 Most Admired Companies in the US has 4 Washington based companies in it, Starbucks, Microsoft, Costco and Nordstrom.